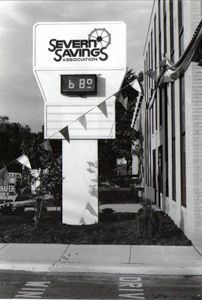 Severn Savings Bank can trace its lineage back to 1946 and a venerable old Baltimore City neighborhood called Highlandtown. That's where the bank started as the "Pompeii Permanent Building Association." Back then, its headquarters was a row house with very limited hours. Pompeii was only open for business two hours per week, between 7-9, Tuesday nights. 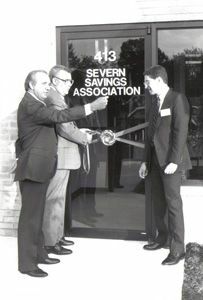 In 1980 Severn relocated its headquarters to Annapolis, MD and began a fulltime operation, though total assets under management were still less than half-a-million dollars. Starting in 1984 changes in legal designations began. Severn evolved from a building and loan to a chartered stock savings and loan, with deposits insured by the Maryland Savings Share Insurance Corporation. Eventually Severn would make the move from a Federal Home Loan Bank to a Federal Stock Savings Bank. In 1990, Severn’s board and stockholders approved a reorganization into a holding company with ownership of Severn Bancorp, Inc.
Today’s Severn Bank is a retail institution with products and services created and marketed specifically for the people of the Chesapeake Bay region. 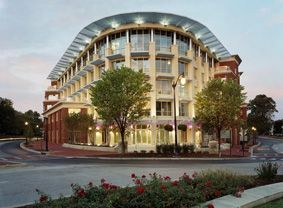 In 2007 Severn Bank moved into its own signature headquarters building on Westgate Circle in downtown Annapolis. The project has become a centerpiece of revival in a long neglected but beautiful corner of Maryland’s capital. Severn Bank offers a full range of savings products, including certificates of deposit, retirement accounts, personal checking accounts and commercial checking accounts. This Severn is a community mortgage lender, emphasizing all types of loans to refinance, purchase, construct and rehabilitate property in Anne Arundel County and other parts of Maryland, Delaware and Northern Virginia. We are also a commercial mortgage lender giving businesses genuine consideration and timely answers in obtaining the funds to purchase property and fuel growth.